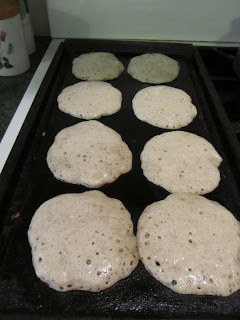 creative savv: Sourdough starter day 5: sourdough pancakes! Sourdough starter day 5: sourdough pancakes! In a medium bowl, beat together the butter, oil and egg. 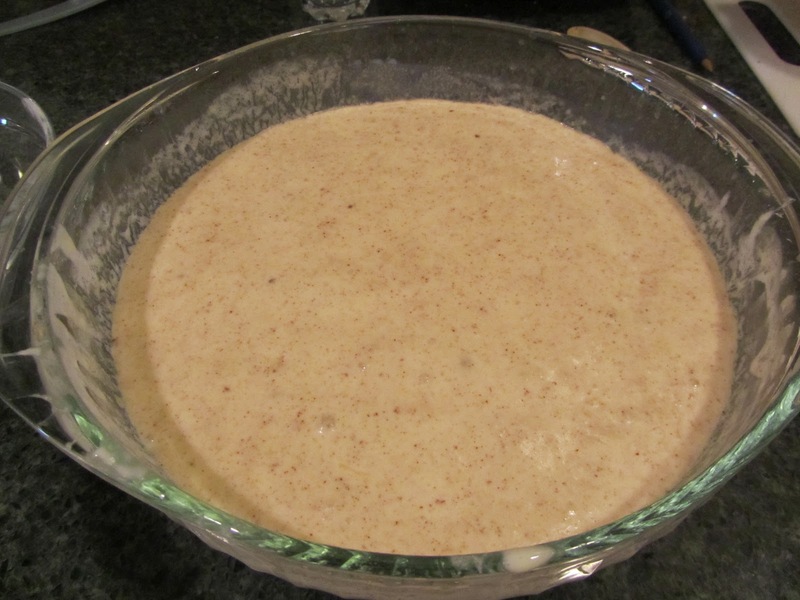 Stir in water, vanilla, sourdough starter and cinnamon. Sprinkle the dry mixture over the starter mixture, then gently fold in. Allow to rest while griddle or skillet preheats, about 5 minutes. Lightly grease the griddle (or skillet). 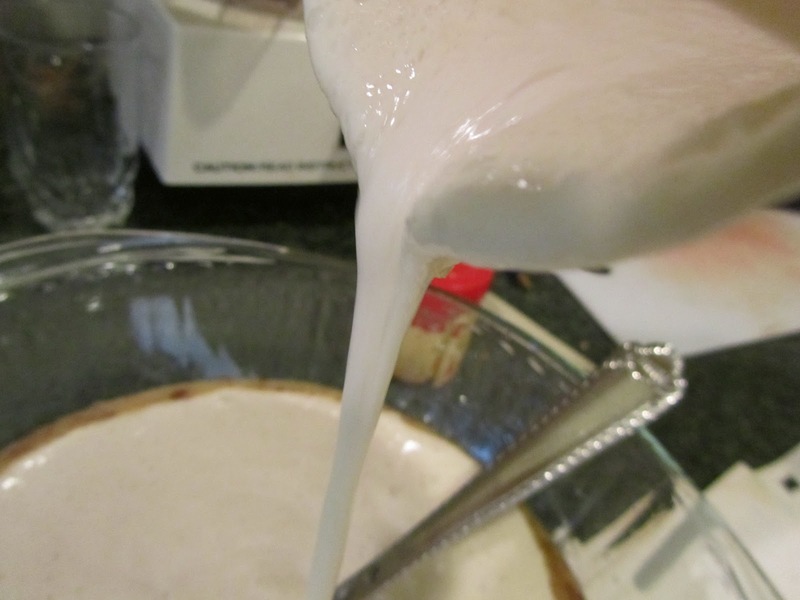 Spoon batter by the large tablespoon onto griddle. They should sizzle at first. If they don't sizzle, the griddle isn't hot enough. Sourdough pancakes require a slightly hotter surface to cook on. Turn as you would regular hot cakes. 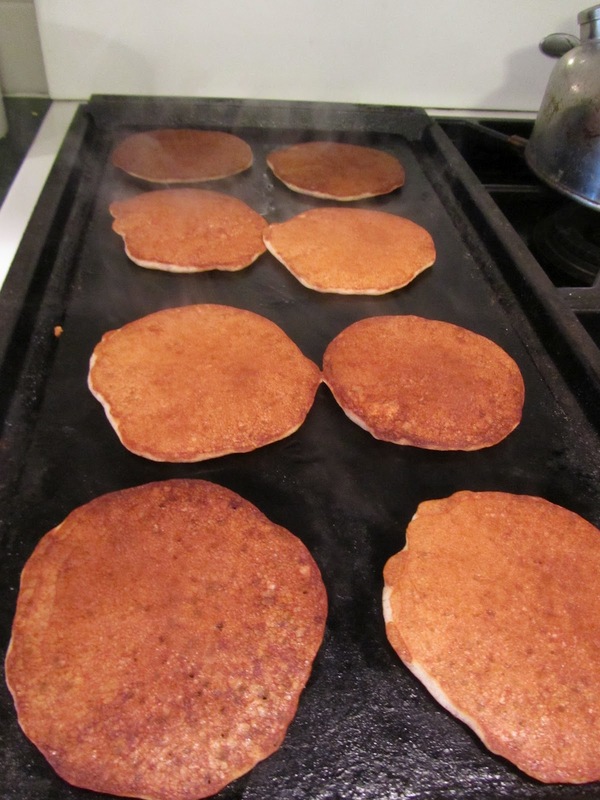 Sourdough pancakes are generally thinner than baking powder ones. The first few are always a bit crispy and so irresistible, I usually eat the first 2 or 3 right off the griddle. Tonight, I served a rhubarb coulis (yes, yet another rhubarb recipe) over the pancakes, instead of syrup. 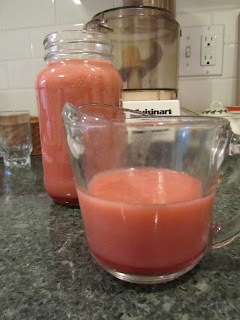 Rhubarb coulis is very simple to make. Basically, it's a rhubarb sauce put through the blender with a bit of extra sugar and water, plus a 1/2 teaspoon (2.5 mL) almond extract. Quite delicious! update--it's the morning after making the pancakes. This morning, the starter was not as bubbly as it had been in previous days. The weather has turned quite cool, and the house went below 60 degrees F(15 C) overnight. After giving it its morning feeding, I moved the starter in to the oven with the light on, about 1 1/2 hours ago. It's beginning to bubble again. I'm glad this happened. It gave me the opportunity to troubleshoot the starter and report back to you. Evidently a fragile starter needs warmer temps to keep from going dormant. Some people will keep their beginning starter in a cabinet that is just above an under cabinet light fixture. My cabinets actually do get warm when I leave the light below on all day. Sourdough Jack's in Alaska would take their starters to bed with them at night, just to keep them warm. Can just picture it, Mom and Dad, the dog, maybe a toddler, and the starter, all cozy in bed -- may need something larger than a King-sized bed! Will update you further on how the starter is doing tomorrow. I like your blog, good helpful ideas. I am gonna try your sourdough starter too. Thank you! Make sure you learn from my mistakes, and keep your sourdough starter in a warmish location (70-75 degrees is about right) while it's first starting. That'll take 1 week, then you can keep it in the fridge, and take it out as you need it. I'll be keeping mine in the oven with the light on tonight! Can't wait for real summer to start here. More to come on what to do with your starter in the next couple of days. Just made these this morning, yum yum! Can see making these again! I'm glad you enjoyed them! I find that I snack on a bunch while I'm cooking the family's breakfast. I eat them plain right off the griddle. They've got that nice crispy texture when first cooked.